maintaining development speed and agility. following DevOps practices and leveraging on cloud services! We are a team of senior consultants specialized in Software Test Automation, Continuous Integration, Continuous Delivery and DevOps practices. We can support your projects on-site, throughout Europe, and offer you remote monitoring, result analysis and maintenance services. We are dedicated to keep your CI/CD pipeline green and enable you to fully leverage on your automation investments. We can also find and train junior consultants for you. We offer you the option of hiring them permanently after 6-12 months, once you are fully convinced by their skills, attitude and performance. Crowdprobe GmbH was founded in 2016 with the initial service offering of high precision web and mobile app performance measurements, without harming consumer privacy. 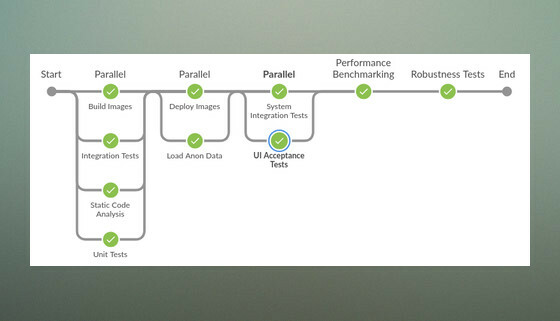 Instead of monitoring users we provided measurements by running synthetic, automated tests. This made it possible to harvest very rich network communication records, using our distributed fleet of real mobile test devices, behind real consumer Internet lines. While this service offering was discontinued in 2018 the company name remained and we continue to offer related consultancy services. From telecom switch via the solaris kernel to online video and various web and mobile apps, using private or public cloud services, we worked on diverse products and tech stack. And we are always looking to extend this list! We are dedicated to adapt to your project, research and bring in what suits you the best, making the most out of your existing skills and investments. In addition to consultancy we are actively developing and operating various Mobile application based services. Reach out and tell us how we can support you.